So this post comes to you with some of my favorite content. I cannot believe this show was already 10 years in the past. The existence of this show totally blows my mind, especially for the time it was on television. It was on a station called “The N” which is a Nickelodeon cable station. For those of you not familiar with Nickelodeon it is an incredibly big production company whose demographic are kids from, I would guess, ages 10-15. Now, it makes sense that it was a subsidiary but still…this was an incredibly inappropriate show for kids. yep…that sums up the difference between how far they could go with the lesbians and the straight people..
With that said, the only sexual content in this show which wasn’t unsuitable for kids was in fact the lesbian content; total b.s. From an article I read about it there were specific rules for the lesbian characters. For example, and I tried to find the real statement and failed, they both could not be shirtless and on the bed touching together. I don’t remember all the rules exactly but when you have the male characters in bathrooms getting blow jobs it seems really unfair that the lesbian characters had so many rules about how and where they could kiss. I’m a bit ahead of myself. For those of you who may not know of this show (I’d be really surprised if you don’t) it is a show about an Ohio family who moves to Los Angeles and how the family integrates into a very different life from what they are used to. The daughter of the family, Spencer, befriends a girl from school, Ashley, and they fall in love. I haven’t watched this show since 2005 but I remember feeling such exciting angst for the couple. This post leads me into my next post. I saw this film last year at Outfest. It took the filmmakers so long to finish it that Outfest held a special screening downtown where I believe the cast and crew were seeing the film for the first time. It was pretty cool. I was sitting right behind Mandy Musgrave whose reactions to her singing were priceless. They all seemed incredibly excited about the film and they should be because it is definitely on my go-to list for a day which needs brightening. When I sat down to watch this movie I had no idea it was going to be a musical. It was an awesome surprise. look at them pretending to do things lovers do, and the world didn’t end, oh my god. This story is about two sisters and a friend. The younger sister has fallen in love with a B actress she met at a coffee shop and the older sister won’t have it. Oh yeah, there are bands. Tasha from the L Word with golf clubs, and lots of really well written songs about life, love, and being naked with hot girls by 2 a.m. There really is no better recipe for a great lesbian title than this one, really. This project began with Angela Robinson, all hail Angela Robinson! as the director of the web series. The web series wasn’t that great…if I’m being honest…but I’ll link you to it and you can decide for yourself. They never finished shooting it, I guess they ran out of money, then Alex Kondracke, who was the DP on the web series, took the reigns of the project as director. She did a phenomenal job. It is such a fun flick, also produced with the Power Up organization. I am so sad I couldn’t stay for the Q&A. My biggest complaint with Outfest was that they booked this film (downtown) I think it was at 4:30 directly followed by the Foxy Merkins in West Hollywood at 7. Dude…it’s only like 10 miles away but in L.A.-time 10 miles can be like a 2 hour drive…so as soon as the credits hit the screen I had to book it. Here’s the “lost Spashley footage” episode of Girltrash. Girltrash All Night Long dvd and swag from Power Up! This show is incredible. It is so fun. It’s about a dude ranch in Palm Desert where people go for a weekend vacation and Cowgirl competition. Mandy Musgrave plays a sharp shooting, horse riding [straight] girl named Dakota. Mandy’s character may be straight but there are plenty of lesbians in the show to keep you smiling. The whole thing is very silly but you’ve got hot girls riding horses, roping cattle, and shooting guns, I’m really not sure how much better it can get. I’m telling you, subscribe to Tello and take advantage of what it has to offer. Also! I have pretty exciting news. I just learned about another site with tons of lesbian content. It’s called KitschMix Tv. Go to it. They have everything so organized. I’ve been binging on great content since I found it. And I still need to watch the rest of Tello and One More Lesbian before subscribing to more but what I did see is that Three Veils (which I talk about in my post about Rolla Selback) can be seen VOD here. 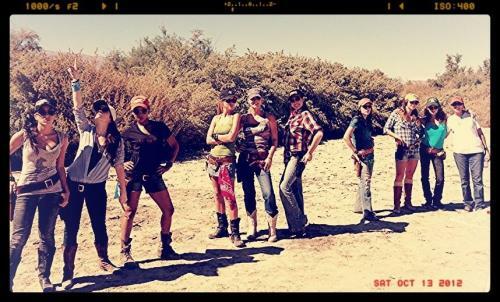 Tags: cowgirl up web series, Gabrielle Christian lesbian, Girltrash the movie, Girltrash the web series, Lesbian Characters in Film, lesbian characters in television, Lesbian Content, Lesbian directors, lesbian web series, Mandy Musgrave lesbian, South of Nowhere lesbians, spashley, tellofilms. Bookmark the permalink. SON used to be my favorite show back in the day, reading this post brought back so many memories.